After five years of rapid growth, the global market began to slow down significantly in 2018. 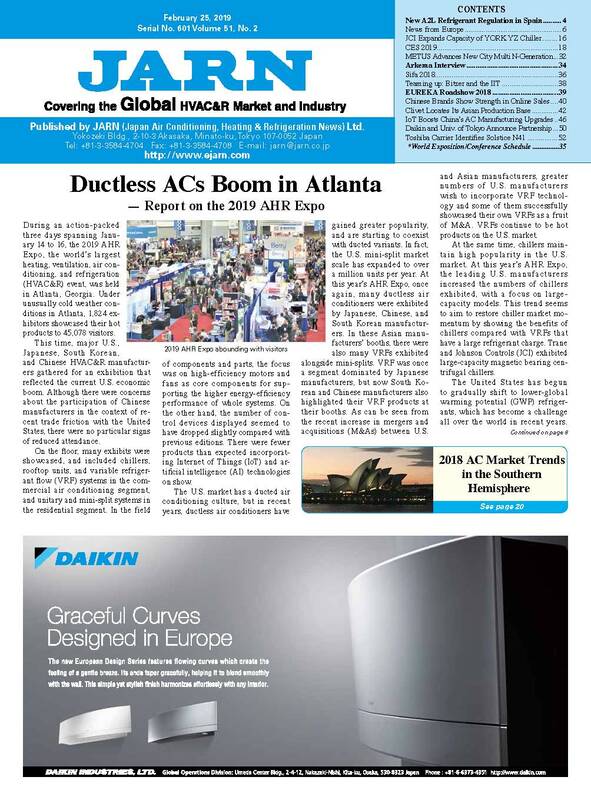 According to JARN, the global air conditioner market in 2018 indicated a 0.6% year-on-year increase, with total demand of up to 130.14 million units. The Southeast Asian and Indian markets were impacted by weather conditions and market growth also fell short of expectations. 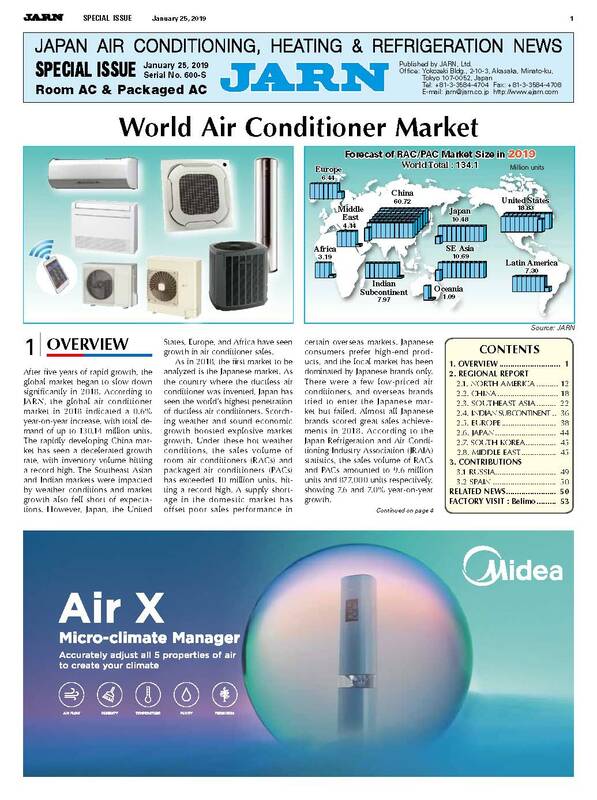 However, Japan, the United States, Europe, and Africa have seen growth in air conditioner sales. 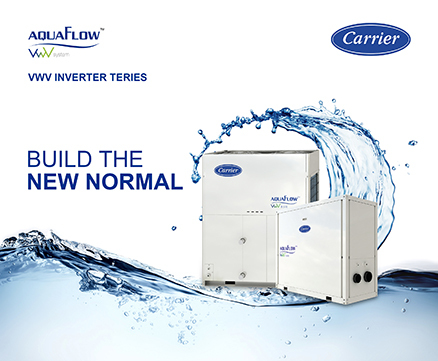 Central air conditioner chiller systems comprise a heat-source chiller and air-side equipment such as air handling units (AHUs) and fan coil units (FCUs), along with pumps used to convey chilled and cooling water, water pipes, cooling towers to dissipate heat outdoors, and other equipment. The total cost of a chiller system varies a great deal and depends on the individual systems and applications. 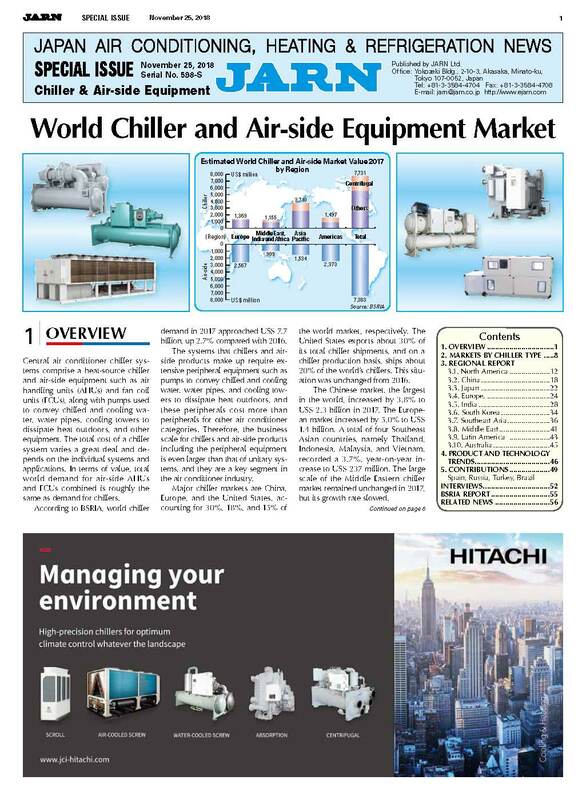 In terms of value, total world demand for air-side AHUs and FCUs combined is roughly the same as demand for chillers. 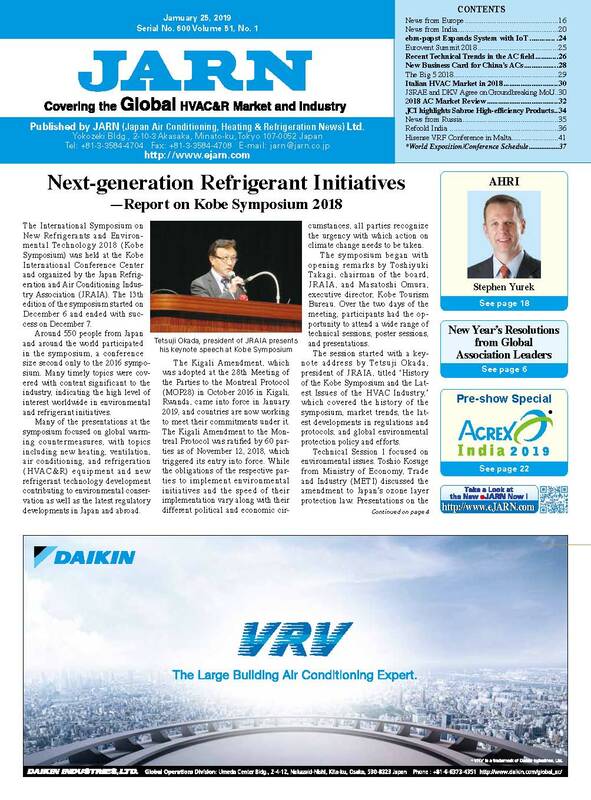 JARN estimates that the global refrigeration market value in 2017 reached US$ 96.3 billion including services such as installation and maintenance, showing an increase of about 4.6% compared with 2016. 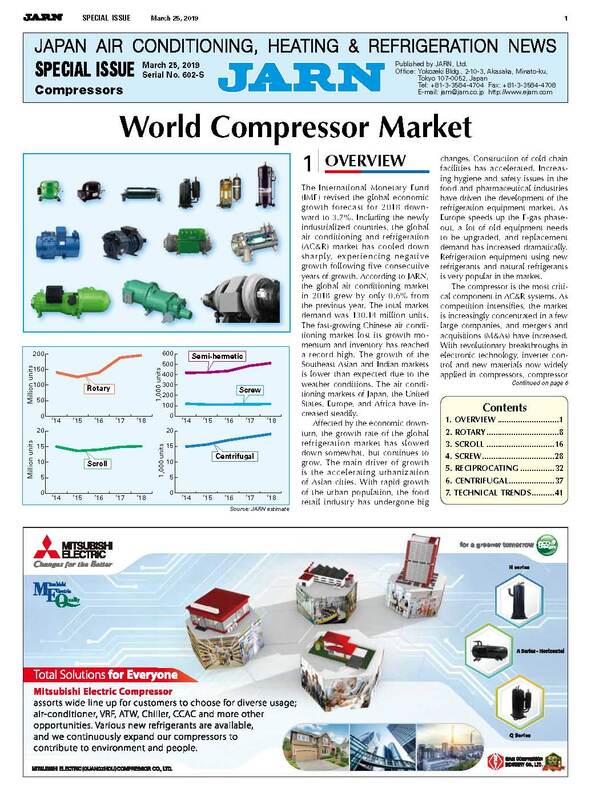 Of the total, commercial applications recorded US$ 61.3 billion, industrial applications amounted to US$ 29.6 billion, and transportation amounted to US$ 5.4 billion. 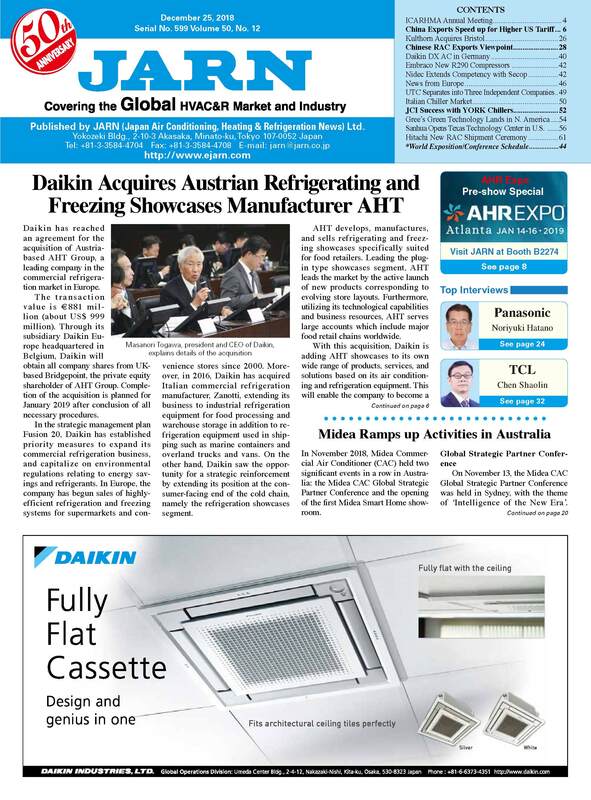 This special issue covers the global market of air-to-water (ATW) heat pump water heater systems, abbreviated as ATW. 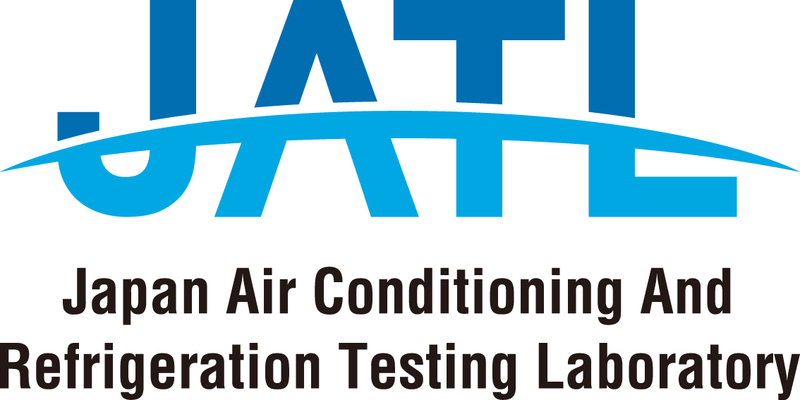 ATW heat pumps collect atmospheric heat from the air which is used as a heat source to heat water for space heating and hot water supply. Heat pump technologies help to save fossil fuels and reduce air pollution. In many countries, using heat pumps is regarded as using renewable energy. The World Economic Outlook from the International Monetary Fund (IMF) reported that the global economic upswing that began around mid-2016 has become broader and stronger. The global economic growth rate reached 3.6% in 2017. 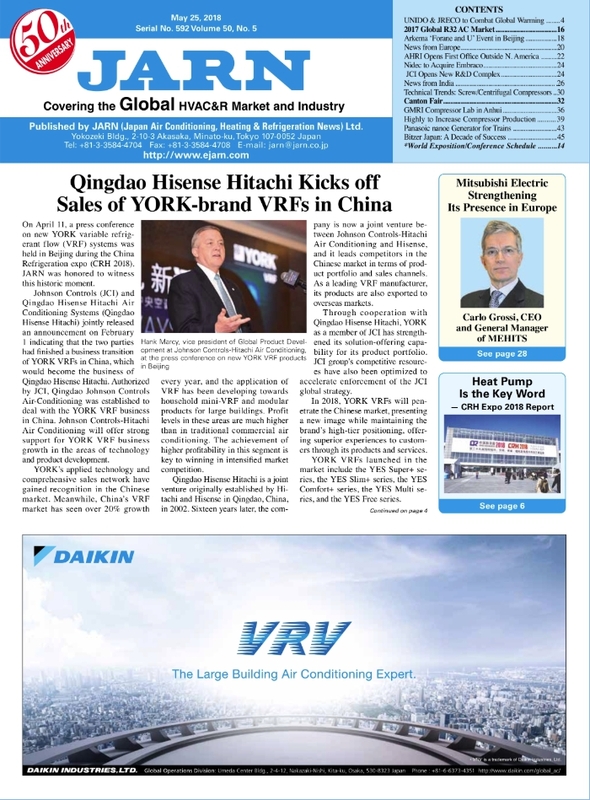 Stimulated by the rising economy, the global variable refrigerant flow (VRF) system market continues to grow steadily and reached 1.7 million units in 2017 based on outdoor units, an increase of 13.5% over the previous year. The International Monetary Fund (IMF) revised the global economic growth forecast for 2018 down-ward to 3.7%. 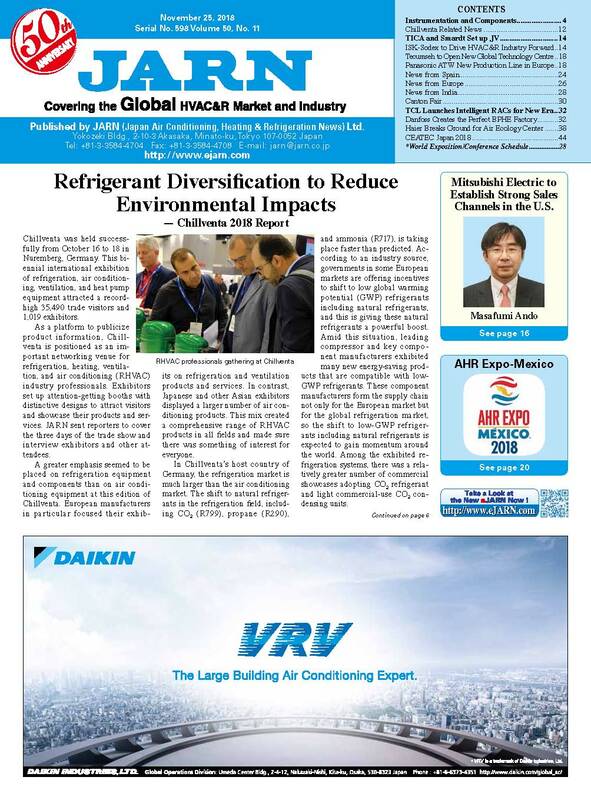 Including the newly industrialized countries, the global air conditioning and refrigeration (AC&R) market has cooled down sharply, experiencing negative growth following five consecutive years of growth. 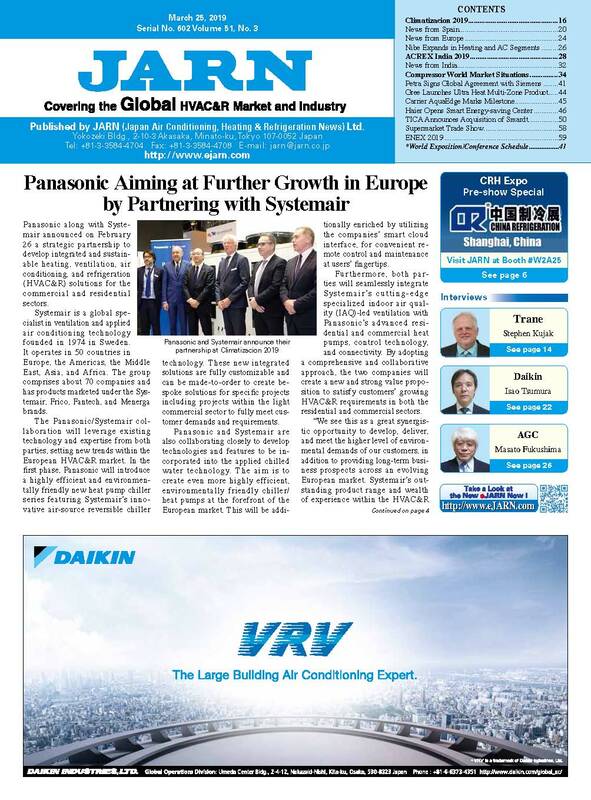 According to JARN, the global air conditioning market in 2018 grew by only 0.6% from the previous year. The total market demand was 130.14 million units.